Wonderfully roomy loaf bag to store your personal items, toiletries and essentials. 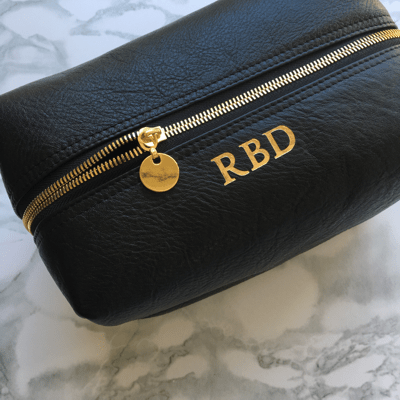 Lined with cotton inside, and personalised with your initials. Personalise your purchase with up to 4 INITIALS/SYMBOLS. You may include both UPPER and LOWER case letters (no numbers). Symbol options – Heart or Africa. Example for layout AW(heart) or (africa)BSR. Please ensure that your personalised text/symbols are entered exactly as you wish to see them on your purchase. Genuine leather loaf bag with gold detailing.